Two types of folate binding proteins are present in serum: a group of low-affinity binders. (K = i0 L/mol), the quanti- tatively most important representative. Sep 2, 1987 - digoxmn, diltiazem, disopyramide, dobutamine, emepronium, enflurane, epinephrine, etomidate, fentanyl, flucloxacillun, flunitrazepam,. B, Rigshospitalet,. University of Copenhagen,. Copenhagen. 2100; and. Department of. Clinical. Chemistry,. Central. Hospital,. Hillerod. 3400,. Denmark; and. coating is used, laboratories that use the Allegro assay system should contact the man- ufacturer ofthe collection devices they use and confirm that the interior of. occurs in patients with renal cell carcinoma undergo- ... IL-6 concentrations were higher in renal venous .... fascia (T3) 8/26, and metastasized (N+M+) 3/26. All. Harrison's principles of internal medicine, 14th ed. New ... Cecil textbook of medicine, 20th ed. ... (5GGTGACACCAAGTTCAAAAACAAC3), and 2â20 ng of. glycoluril). (8,. 9) as the chromogen. From The Burnsides Research Laboratory, University of Illinois at Urbana-Champaign,. Urbana, Ill. 61801, and The Nuclear. Aviv Associates,. Lakewood,. N.J. 08701, and Environmental .... tics, Marlboro, Mass. 01752), which is ... Ridge, N.J. 07438) or 0.15-mm-thick glass microscope. disease. J Clin Endocrinol 1984;59:240â5. 10. Tamaki H, Takeoka K, Nishi I, ... Molar pregnancy was suspected .... Gestational trophoblastic disease: subse-. between-nm ranged from 3.4% to 8.3% and from 3.6% to. 6.2%, respectively. 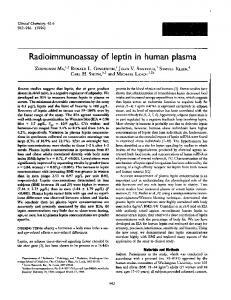 Variation in plasma leptin concentra- tions in specimens collected on consecutive. 5 Nonstandard abbreviations, ALL, acute lymphoblastic leukemia; NHL, non-Hodgkin lymphoma; CNS, central nervous system; (HD)MTX, (highdose) methotrexate; BFM, Berlin-Frankfurt-Munster Cooperative Group; UKALL, United Kingdom ALL Cooperative Group; COG, Children’s Oncology Group; AUC, area under curve; and CCR, continuous complete remission. ence of folate antagonists; the potential of homocysteine to reflect either MTX toxicity or treatment efficacy has been studied (20 –24 ) and reviewed (25 ). In our in-house pilot study carried out during 1999 and 2000, we gathered data suggesting that a strong correlation may exist between MTX exposure and time-dependent changes in homocysteine whole-body accumulation, implying that homocysteine may behave as a marker of the in vivo antifolate effect of MTX at the individual patient level. Observing a case with severe toxicity after the first but not the second course of HDMTX administration within the duration of this study (26 ) further stimulated us to investigate the relationship between homocysteine accumulation and MTX exposure to elucidate the sequence in antifolate/folate whole-body pharmacodynamics. To accomplish this we defined an in vivo functional model induced by treatment with MTX characterized as a timedependent, multiparametric in situ system in which (a) input variables were plasma pretreatment (t0) folate, vitamin B12, and homocysteine, and (b) output variables were plasma total MTX area under the curve (AUC0 h-⬁) and plasma homocysteine AUC0 – 66 h obtained for every HDMTX course of administration. In the present study, we prospectively assessed time profiles of plasma homocysteine, folate, and vitamin B12 concentrations in children with newly diagnosed ALL and NHL treated with repeated courses of HDMTX with subsequent leucovorin rescue. The endpoints of this study were to determine how drug exposure (mtxAUC0 h-⬁) is related to the wholebody homocysteine accumulation (hcysAUC0 – 66 h) and whether it is influenced by pretreatment plasma folate and/or vitamin B12 concentrations. 6 The BFM 95 protocols (3, 15 ) are designed to administer chemotherapy in 3 phases: induction therapy, consolidation therapy, and late intensification therapy. Remission induction consists of 64 days of intensive polychemotherapy with vincristine and doxorubicine (days of administration: 8, 15, 22, and 29, specifying “days from diagnosis”), prednisolone (days 1 through 38), native l-asparaginase (administered 3 times daily for 8 consecutive days, starting from day 12), cyclophosphamide (days 36 and 64), oral 6-mercaptopurine (days 36 through 63), cytosine-arabinoside (administered in 4 courses over 4 days each on days 38 through 41, 45 through 48, 52 through 55, and 59 through 62), and intrathecal MTX (days 1, 12, 33, 45, and 59). Consolidation therapy (or CNS-directed therapy) starts at the 12th week from diagnosis and consists of 4 courses of systemic intravenous HDMTX with leucovorin rescue administered on days 85, 99, 113, and 127. Consolidation therapy can be started only if complete cytomorphologic and radiologic remission is achieved. Late intensification (or reinduction) therapy repeats the induction treatment with the same drugs and lasts for 7 weeks. the parent or guardian of each patient. After obtaining Institutional Review Board approval, we incorporated measurements of homocysteine, folate, and vitamin B12 into the above-mentioned protocols. All children received HDMTX therapy at a dose of 5 g/m2 over 24 h along with intrathecal chemotherapy, given 1 h after the beginning of HDMTX infusion for children with ALL, 2 h after the beginning of HDMTX infusion for children with lymphoblastic lymphomas, and 24 h after the beginning of MTX infusion for children with B-cell NHL, as specified by the respective BFM 95 protocols. Leucovorin rescue started 42 h after initiation of the HDMTX infusion, with a dosage of 15 mg/m2 every 6 h for “standard eliminators” (usually 3 doses) with intensified leucovorin rescue for a minority of patients with higher plasma MTX concentrations or prolonged elimination. Samples for plasma MTX and homocysteine were obtained via central venous lines. Data were analyzable in 30 patients for courses 1 ⫹ 2, in 22 patients for courses 1 ⫹ 2 ⫹ 3, and in 16 patients for courses 1 ⫹ 2 ⫹ 3 ⫹ 4. Two children with high-risk ALL received only 2 cycles of HDMTX because their treatment had to be changed because of disease resistance, and 1 child with Burkitt NHL received only 3 cycles of HDMTX because of severe treatment-related toxicity. Sampling errors in t0 specimens were the main reasons that HDMTX courses, although accurately administered, were not used for the final calculations. Altogether, we analyzed 98 treatment courses of HDMTX. total estimate of mtxAUC0 h-⬁; and an estimate describing the elimination phase mtxAUC24 h-⬁. Both AUC values were found to be highly correlated (rPearson ⬎0.98); we therefore selected the total mtxAUC0 h-⬁ for final analyses as a more accurate and quantitative measure of patient overall exposure to MTX. All concentrations (homocysteine, MTX, vitamin B12, and folate) revealed log-normal distribution with slightly bimodal characteristics given by differences among groups of patients. The data were therefore log-transformed [xtr ⫽ ln(x ⫹ 1)] before statistical analysis, and all subsequent evaluations were based on geometric means and their confidence limits (27, 28 ). If necessary, final estimates of geometric means were corrected to reduce bias attributable to small group sizes (29, 30 ). The final results are presented as the original values after back-conversion through an exponential function. Selected extreme points (up to 2 per experimental variant) were excluded to reach homogeneity of variance for parametric testing. Pairwise and multiple comparisons of time-related changes as well as comparisons of different subgroups of patients were based on one-way ANOVA models followed by Tukey multiple range tests (31 ). The best cutoff values for continuous variables related to changes in homocysteine concentrations (initial folate concentration and mtxAUC) were estimated on the basis of ANOVA models giving the maximum ratio of between-group variability to within-group variability (variance ratio). methods Blood for homocysteine, folate, and vitamin B12 determinations was drawn into closed tripotassium EDTA-containing CBC tubes (Sarstedt); plasma was removed immediately after centrifugation to prevent prolonged cell contact and was frozen at ⫺70 °C until analyses were performed. Homocysteine was determined by Abbott AxSYM, MTX by Abbott TDx, and folate and vitamin B12 by Roche Elecsys assays according to instructions from each of the manufacturers. Results clinical outcomes Nineteen of 21 children with ALL remain in first continuous complete remission (CCR) and all 11 children with NHL are in first CCR, with median follow-up 36 months (range, 19 –50 months). Two children, one with Ph1positive ALL and one with acute hybrid leukemia, developed a relapse or treatment-resistant disease and subsequently died. Toxicities observed in our cohort after the HDMTX cycles were comparable to those reported for the same scheme of MTX administration (15 ). Applying Common Toxicity Criteria (32 ), we found no significant statistical differences between toxicity profiles of cycles 1 and subsequent cycles. With the exception of initial folate values, there were no statistically significant differences among therapeutic courses 1– 4. b Initial plasma folate concentrations in courses 3 and 4 were significantly increased compared with courses 1 and 2 (P ⬍0.014, Mann–Whitney test). confirmed by pairwise testing, which indicated only increasing t0 concentrations of plasma folate during consecutive therapeutic cycles. of consecutive MTX courses. This trend was also paralleled by t42 peak plasma homocysteine concentrations. On the other hand, the AUC for plasma total MTX remained virtually unaltered through courses 1 to 4, indicating that overall exposure to the drug remained unchanged. A decreasing but insignificant trend was observed at the peak plasma MTX concentrations at t24. These results indicate that whole-body homocysteine accumulation (hcysAUC0 – 66 h) is a pharmacodynamic value that almost linearly increases in response to administration of MTX and that such a trend is immediately reversed by administration of folinic acid (Fig. 1). This trend was significant only between the first and the second courses of MTX administration and disappeared almost completely in courses 3 and 4.
a P values for t42 peak plasma homocysteine: course 1 vs course 2, P ⫽ 0.041; course 1 vs course 3, P ⫽ 0.018; course 1 vs course 4, P ⫽ 0.016. P values for plasma homocysteine AUC averaged from hcysAUC0 – 66 interval: course 1 vs course 2, P ⫽ 0.018; course 1 vs course 3, P ⫽ 0.014; course 1 vs course 4, P ⫽ 0.009. b,c Statistically significant differences among therapeutic courses 1– 4 where within a given variable/column, courses indicated by the same letter are significantly different (P ⬍0.05, ANOVA). Fig. 1. Time profiles of plasma homocysteine concentrations during consecutive courses of HDMTX. Panels are labeled according to course number. Concentrations are shown as the geometric mean and 95% confidence interval (error bars). ⴱ indicate concentrations significantly different from initial values (t0). Plasma homocysteine concentrations increased linearly from the start (t0) through cessation of MTX therapy (t24) up to time point t42, when this trend was invariably stopped and reversed to first-order elimination by administration of folinic acid, which occurred just before the t42 specimen was taken for homocysteine and MTX determinations. critical determinant responsible for the decreasing propensity of plasma homocysteine to reflect exposure to MTX during the consecutive MTX-containing therapeutic cycles. To examine this finding further (Fig. 2), we categorized drug exposure (mtxAUC0 h-⬁; categories I, II, and III, according to the magnitude of increase) against endogenous homocysteine accumulation [expressed as the extent of homocysteine accumulation (hcysAUC0 – 66 h)] among consecutive therapeutic courses 1– 4. Apparently, the only significant variation was within course 1, implying that only an “unprimed” patient body is capable of generating a substantial amount of the indicator–and possibly toxic—molecule homocysteine (25 ), and that this tendency invariably disappears with subsequent cycles administered, although MTX exposure remains virtually unchanged. a Group A included 30 courses with the following distribution: course 1, n ⫽ 20; course 2, n ⫽ 6; course 3, n ⫽ 2; course 4, n ⫽ 2. Group B included 68 courses with the following distribution: course 1, n ⫽ 10; course 2, n ⫽ 24; course 3, n ⫽ 20; course 4, n ⫽ 14. Total number of courses ⫽ 98. b Statistically significant different among therapeutic courses in groups A and B differing by initial plasma folate concentrations. We were also interested in whether initial plasma folate concentrations modulate the magnitude of the drug exposure and whether and/or how this exposure is reflected by the whole-body homocysteine accumulation. As shown in Fig. 3, we categorized the drug exposure against the whole-body homocysteine accumulation in therapeutic courses according to initial plasma folate concentration (groups A and B; also see Table 3). Apparently, in the patients with low precourse folate (group A), the magnitude of drug exposure revealed the expected increasing trend in whole-body homocysteine accumulation. Again, however, almost no response in homocysteine accumulation was observed in those patients with increased precourse concentrations of plasma folate. Fig. 2. Categorization of drug exposure against endogenous homocysteine accumulation among consecutive therapeutic courses. Drug exposure is categorized according to the magnitude of increase in total MTX (mtxAUC0 h-⬁): category I, ⬍1000 ␮mol 䡠 L⫺1 䡠 (h0-⬁)⫺1; category II, 1000 –1599 ␮mol 䡠 L⫺1 䡠 (h0-⬁)⫺1; category III, ⱖ1600 ␮mol 䡠 L⫺1 䡠 (h0-⬁)⫺1. Endogenous homocysteine accumulation is expressed as hcysAUC0 – 66 h. Results are shown for consecutive therapeutic courses (1, 2, and 3 ⫹ 4). The only significant variation was within course 1, and this tendency disappeared with subsequent courses, although MTX exposure remained virtually unchanged. A and B indicate statistically significant differences. Category I vs II, P ⫽ 0.562; category I vs III, P ⫽ 0.031; category II vs III, P ⫽ 0.118. Fig. 3. Categorization of drug exposure against whole-body homocysteine accumulation in patients grouped according to precourse plasma folate concentrations (also see Table 3). (A), group A (precourse folate ⬍10 nmol/L); (B), group B (precourse folate ⱖ10 nmol/L). Drug exposure is categorized according to the magnitude of increase in total MTX (mtxAUC0 h-⬁): category I, ⬍1000 ␮mol 䡠 L⫺1 䡠 (h0-⬁)⫺1; category II, 1000 –1599 ␮mol 䡠 L⫺1 䡠 (h0-⬁)⫺1; category III, ⱖ1600 ␮mol 䡠 L⫺1 䡠 (h0-⬁)⫺1. Values are the geometric mean and 95% confidence interval (error bars). In the courses with low initial folate (A), the magnitude of drug exposure revealed the expected increasing trend in whole-body homocysteine accumulation. P values in low-folate group (A) only: category I vs II, P ⫽ 0.527; category I vs III, P ⫽ 0.026; category II vs III, P ⫽ 0.33.
approach to evaluating the contribution of HDMTX to overall therapeutic success in children with ALL (34 ) may be that the susceptibility of chemotherapy-naive ALL blasts to MTX at disease presentation is probably different from the responsiveness of chemotherapy-exposed blasts, such as those in minimal residual disease and/or in cases of “molecular remission” only, when essentially no blast cells are detectable despite their being a target of HDMTX chemotherapy. This fact, along with technical issues (35 ), may lessen the current clinical usefulness of microarraybased in vitro single-cell data obtained on chemotherapynaive blasts at disease presentation because this approach does not adequately reflect the “real-life” situations that occur in clinical practice. We found that plasma precourse folate concentration was the principal determinant of the magnitude of both peak MTX plasma concentrations and the extent of wholebody homocysteine accumulation in response to MTX administration, supporting the original “folate overrescue concept” first pointed out by Borsi et al. in the early 1990s (36 ). Because differences in relapse rates in their study did not reach statistical significance, it remained largely unnoticed by the medical community. Nevertheless, since then, published reports from various medical fields, including dermatology (37 ), gynecology (38 ), and oncology (26 ), have collectively indicated that increased endogenous folate concentrations may indeed a priori neutralize the antimetabolic effect of MTX. 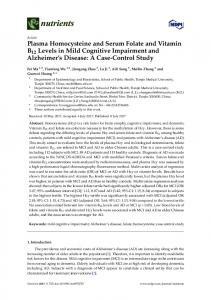 These reports, although indicating the existence of a potentially detrimental consequence, have not yet led to a systematic study of the timing of leucovorin/MTX administration, although the clinical effectiveness of MTX-containing regimens different from the original 5 g/m2 over 24 h specified by BFM 95 is well known both within and outside the BFM group. For example, one BFM retrieval therapy that has been effectively used by the BFM group since 1986 for children who relapsed after initial treatment with 5 g of MTX over 24 h involves administering 1 g of MTX delivered over 36 h, with only 2 doses of leucovorin (given at 48 and 54 h) (39, 40 ). Furthermore, substantially lower but escalating doses of MTX, with no leucovorin rescue, followed by administration of asparaginase (Capizzi methotrexate) are key elements of “augmented BFM therapy”, which has been shown to be efficacious in the treatment of higherrisk childhood ALL (5 ). 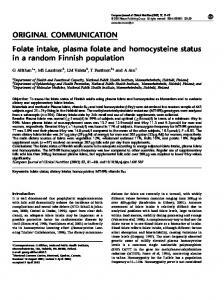 To explain the increasing precourse plasma folate concentrations, we investigated the number of blood transfusions administered, vitamin supplementation, and food habits; however, we found no possible explanation for the increased pretreatment folate other than that originating from the folinic acid rescue administered during previous therapeutic cycles. We showed that homocysteine whole-body accumulation increases in response to MTX administration and that this increase is immediately reversed by administration of folinic acid. Furthermore, we demonstrated that the precourse plasma concentrations of endogenous folate affected both the magnitude of the whole-body homocysteine accumulation and the peak plasma MTX concentrations and that these changes were not reflected in the total body drug exposure. Our findings cannot, however, completely exclude another possibility of attenuated homocysteine response to MTX administration, such as some extent of “metabolic adaptation” to repeated MTX exposure. Homocysteine response to MTX treatment in the absence of leucovorin rescue also remains an open issue necessitating further investigation. A COG trial with Capizzi methotrexate (19 ) may directly address this problem provided that plasma folate and homocysteine assessments be incorporated. In our opinion, the timing of HDMTX administration, which occurs in late phases of antineoplastic therapy, did not reflect in our results per se, the only significant variable being the respective precourse plasma folate concentrations. In conclusion, our findings collectively indicate that endogenous pretreatment plasma folate may play a decisive role in modulating the whole-body antifolate effect of MTX, providing support for an original “folate overrescue” concept. This work was supported by contract grants NC7104-3 and NR 8448-3/2005 from the Ministry of Health of The Czech Republic. We thank Vlasta Gregorova and Kristina Otevrelova for technical help and data management, and Borek Vojtesek, Lenka Dubska, and Martin Radina for critical comments and suggestions. The travel expenses for D.V. to the “42nd TDM Renaissance and Pharmacogenomic Forum III” were supported by Roche. References 1. Hill FG, Richards S, Gibson B, Hann I, Lilleyman J, Kinsey S, et al. The UK Medical Research Council Working Party on Childhood Leukemia. Successful treatment without cranial radiotherapy of children receiving intensified chemotherapy for acute lymphoblastic leukemia: results of the risk-stratified randomized central nervous system treatment trial MRC UKALL XI (ISRC TN 16757172). Br J Haematol 2004;124:33– 46. 2. Cohen IJ. Defining the appropriate dosage of folinic acid after high-dose methotrexate for childhood acute lymphatic leukemia that will prevent neurotoxicity without rescuing malignant cells in the central nervous system. J Pediatr Hematol Oncol 2004;26: 156 – 63. 3. Sterba J, Valik D, Bajciova V, Kadlecova V, Gregorova V, Mendelova D. High-dose methotrexate and/or leucovorin rescue for the treatment of children with lymphoblastic malignancies: do we really know why, when, and how? 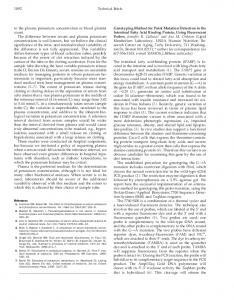 Neoplasma 2005;6:456 – 63. 4. Balis MF, Holcenberk JC, Blaney SM, General principles of chemotherapy. In: Pizzo P, Poplack D, eds. Principles and practice of pediatric oncology. Philadelphia: Lippincott, 2002:237–308. 5. Nachman J, Sather HN, Cherlow JM, Sensel MG, Gaynon PS, Lukens JN, et al. Response of children with high-risk acute lymphoblastic leukemia treated with and without cranial irradiation: a report from the Children’s Cancer Group. J Clin Oncol 1998;16:920 –30. 6. Margolin JF, Steuber CP, Poplack DG. Acute lymphoblastic leukemia. In: Pizzo P, Poplack D, eds. Principles and practice of pediatric oncology. Philadelphia: Lippincott, 2002:516. 7. Borsi JD, Moe PJ. Systemic clearance of methotrexate in the prognosis of acute lymphoblastic leukemia in children. Cancer 1987;60:3020 – 4. 8. Clarke M, Gaynon P, Hann I, Harrison G, Masera G, Peto R, et al. CNS-directed therapy for childhood acute lymphoblastic leukemia: Childhood ALL Collaborative Group overview of 43 randomized trials. J Clin Oncol 2003;21:1798 – 809. 9. Mantadakis E, Cole PD, Kamen BA. High-dose methotrexate in acute lymphoblastic leukemia: where is the evidence for its continued use? 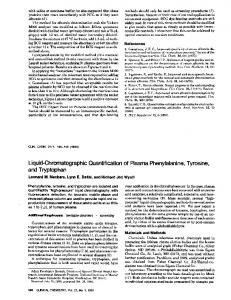 Pharmacotherapy 2005;25:748 –55. 10. Borsi JD, Sagen E, Romslo I, Moe PJ. Rescue after intermediate and high-dose methotrexate: background, rationale, and current practice. Pediatr Hematol Oncol 1990;7:347– 63. 11. Kamen BA. High-dose methotrexate and asparaginase for the treatment of children with acute lymphoblastic leukemia: why and how? J Pediatr Hematol Oncol 2004;26:333–5. 12. Zhao R, Goldman ID. Resistance to antifolates. Oncogene 2003; 22:7431–57. 13. Djerassi I. Methotrexate infusions and intensive supportive care in the management of children with acute lymphocytic leukemia: follow-up report. Cancer Res 1967;27:2561– 4. 14. Woessmann W, Seidemann K, Mann G, Zimmermann M, Burkhardt B, Oschlies I, et al. The impact of the methotrexate administration schedule and dose in the treatment of children and adolescents with B-cell neoplasms: a report of the BFM Group Study NHL-BFM95. Blood 2005;105:948 –58. 15. Schrappe M, Reiter A, Zimmermann M, Harbott J, Ludwig WD, Henze G, et al. Long-term results of four consecutive trials in childhood ALL performed by the ALL-BFM study group from 1981 to 1995, Berlin-Frankfurt-Munster. Leukemia 2000;14:2205–22. 16. Capizzi RL. Asparaginase-methotrexate in combination chemotherapy: schedule-dependent differential effects on normal versus neoplastic cells. Cancer Treat Rep 1981;65(Suppl 4):115–21. 17. Lobel JS, O’Brien RT, McIntosh S, Aspnes GT, Capizzi RL. Methotrexate and asparaginase combination chemotherapy in refractory acute lymphoblastic leukemia of childhood. Cancer 1979;43: 1089 –94. 18. Nachman JB, Sather HN, Sensel MG, Trigg ME, Cherlow JM, Lukens JN, et al. Augmented post-induction therapy for children with high-risk acute lymphoblastic leukemia and a slow response to initial therapy. N Engl J Med 1998;338:1663–1671. 19. National Cancer Institute, U.S. National Institutes of Health. Phase III randomized study of dexamethasone versus prednisone during induction and high-dose methotrexate with leucovorin rescue versus escalating-dose methotrexate without leucovorin rescue during interim maintenance I in patients with newly diagnosed high-risk acute lymphoblastic leukemia http://www.cancer.gov/search/ ViewClinicalTrials.aspx?cdrid⫽349182&protocolsearchid⫽1707647& version⫽healthprofessional, (accessed September 2005). 20. Kishi S, Griener J, Cheng C, Das S, Cook EH, Pei D, et al. Homocysteine, pharmacogenetics, and neurotoxicity in children with leukemia. J Clin Oncol 2003;21:3084 –91. 21. Refsum H, Ueland PM, Kvinnsland S. Acute and long-term effects of high-dose methotrexate treatment on homocysteine in plasma and urine. Cancer Res 1986;46:5385–91. 22. Refsum H, Wesenberg F, Ueland PM. Plasma homocysteine in children with acute lymphoblastic leukemia: changes during a chemotherapeutic regimen including methotrexate. Cancer Res 1991;51:828 –35. 23. Broxson EH Jr, Stork LC, Allen RH, Stabler SP, Kolhouse JF. Changes in plasma methionine and total homocysteine levels in patients receiving methotrexate infusions. Cancer Res 1989;49: 5879 – 83. 24. Ueland PM, Refsum H, Male R, Lillehaug JR. Disposition of endogenous homocysteine by mouse fibroblast C3H/10T1/2 Cl 8 and the chemically transformed C3H/10T1/2 MCA Cl 16 cells following methotrexate exposure. J Natl Cancer Inst 1986;77: 283–9. 25. Valik D, Radina M, Sterba J, Vojtesek B. Homocysteine: exploring its potential as a pharmacodynamic biomarker of antifolate chemotherapy. 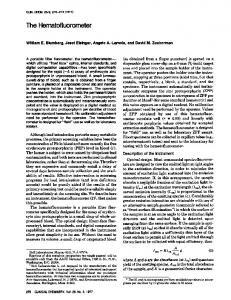 Pharmacogenomics 2004;5:1151– 62. 26. Valik D, Sterba J, Bajciova V, Demlova R. Severe encephalopathy induced by the first but not the second course of high-dose methotrexate mirrored by plasma homocysteine elevations and preceded by extreme differences in pretreatment plasma folate. Oncology 2005;69:269 –72. 27. Snedecor GW, Cochran WG. Statistical methods, 7th ed. Ames, IA: Iowa State University Press, 1980. 28. Parkin TB, Robinson JA. Analysis of lognormal data. Adv Soil Sci 1992;20:193–235. 29. Kleijnen JPC. Statistical tools for simulation practitioners. New York: Marcel Dekker, 1987:429pp. 30. Parkin TB, Chester ST, Robinson JA. Evaluation of methods for calculating confidence intervals about the mean of a lognormally distributed variable. Soil Sci Soc Am J 1990;54:321– 6. 31. Zar JH. Biostatistical analysis, 2nd ed. London: Prentice Hall, 1984:718pp.. 32. US Food and Drug Administration, Center for Drug Evaluation and Research. Toxicity criteria. http://www.fda.gov/cder/cancer/ toxicityframe.htm (accessed ???). 33. Evans WE, Relling MV, Rodman JH, Crom WR, Boyett JM, Pui CH. Conventional compared with individualized chemotherapy for childhood acute lymphoblastic leukemia. N Engl J Med 1998;338: 499 –505. 34. Kager L, Cheok M, Yang W, Zaza G, Cheng Q, Panetta JC, et al. Folate pathway gene expression differs in subtypes of acute lymphoblastic leukemia and influences methotrexate pharmacodynamics. J Clin Invest 2005;115:110 –7. 35. Miklos GL, Maleszka R. Microarray reality checks in the context of a complex disease. Nat Biotechnol 2004;22:615–21. 36. Borsi JD, Wesenberg F, Stokland T, Moe PJ. How much is too much? Folinic acid rescue dose in children with acute lymphoblastic leukemia. Eur J Cancer 1991;27:1006 –9. 37. Hills RJ, Ive FA. Folinic acid rescue used routinely in psoriatic patients with known methotrexate “sensitivity”. Acta Derm Venereol 1992;72:438 – 40. 38. Takacs P, Rodriguez L. High folic acid levels and failure of single-dose methotrexate treatment in ectopic pregnancy. Int J Gynaecol Obstet 2005;89:301–2. 39. Henze G, Fengler R, Hartmann R, Kornhuber B, Janka-Schaub G, Niethammer D, et al. H. Six-year experience with a comprehensive approach to the treatment of recurrent childhood acute lymphoblastic leukemia (ALL-REZ BFM 85): a relapse study of the BFM group. Blood 1991;78:1166 –72. 40. Herold R, von Stackelberg A, Hartmann R, Eisenreich B, Henze G. Acute lymphoblastic leukemia-relapse study of the Berlin-Frankfurt-Munster Group (ALL-REZ BFM) experience: early treatment intensity makes the difference. J Clin Oncol 2004;22:569 –70. Report "Pretreatment Plasma Folate Modulates the ... - Clinical Chemistry"